Convert your desk and put an end to the desk wobble with the UPLIFT 2-Leg to 3-Leg Conversion Kit. This crucial conversion kit allows you to turn your 2-leg adjustable height desk into one that boasts the stability of a 3-leg desk with one easy addition. With this newfound freedom, you'll have the ability to turn your rectangular desk into an L-shaped workstation in no time. Just install it and you're good to go. The UPLIFT 2-Leg to 3-Leg Conversion Kit comes with a desk-elevating leg, mounting bracket, connecting wire, control box, and an optional switch so you can use your current standing desk frame without needing to buy a new one. Why do I need the 2-Leg to 3-Leg Conversion Kit? If you've ever wanted to expand your desk setup into an L-shaped workstation, the UPLIFT 2-Leg to 3-Leg Conversion Kit is the tool to take you there. This is the kit that allows you to modify your current rectangular desk into an L-shaped workstation, without having to buy a few frame. We designed the UPLIFT 2-Leg to 3-Leg Conversion Kit to match with your UPLIFT Desk Frame. Pick yours in black, white, gray, or metallic (industrial style) powder-coated finishes. 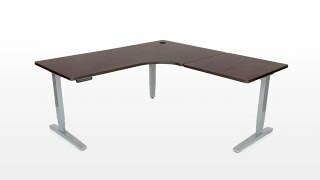 Can I just buy a 3-Leg Desk? Yes you can! If you just want to start over or need a new desk, our UPLIFT Height Adjustable Standing Desk with L-Shaped Top is ideal for you. However, if you love your desk frame and top and want to keep them, our conversion kit will help and save you a bit of money! The default keypad that allows basic up/down functionality for your desk. Simply press and hold to raise or lower the desktop to your preferred heights. The 1-touch advanced digital memory keypad shows the height of the desktop above the ground in inches, and can store four different heights in its memory. Programming the keypad is easy; when the desk is at the desired height, press the M button, then a number to assign the current position to that number. Now you're set. In order to meet an unforeseen high demand, we are manufacturing a limited expedited production batch of our 3rd legs at a higher cost, and can ship your order mid-February instead of waiting for our normal production batch to be ready to ship in early March. However, if you don't mind waiting until early March for your order to ship, we'll pass along our $50 of production savings to you! Just select Normal Lead Time and you'll save $50 on your new desk, and your desk will ship a few weeks later.